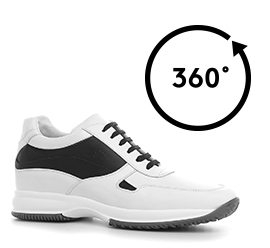 Versatile and comfortable handcrafted elevator sneakers in black & white calfskin leather and rubber sole. A colour combination that never goes out of fashion and allows matches with any outfit, from jeans to linen trousers and shorts. GuidoMaggi inner elevator system can be customized up to 4 inches according to needs: an effective way to become taller in a simple and discreet way.